It seems that here in Central Texas we’re kind of limited on our recycling options. One of the thing that annoys the hell out of me for example was the situation with CFL light bulbs. 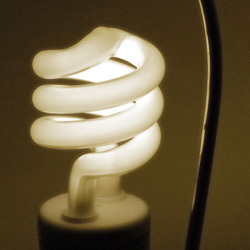 CFL are compact fluorescent lamps, that means they are not traditional light bulbs and use a fraction of the energy required by traditional light bulbs. Also even if they are a bit more expensive to buy they have a longer lifetime than regular light bulb which means it’s probably a win in the end economically. Now the problem is that those light bulbs shouldn’t be disposed with the regular trash because they contain trace amounts of mercury (as well as other - less toxic but that would gain to be recycled - materials). But even as we have a lot communication/propaganda encouraging to use CFL instead of light bulbs, we don’t seem to have the equivalent effort to make sure they are properly disposed. It’s as if the problem is Taboo. Hard to swallow from people that encourage other people to act more ecologically. Anyway it seems there is a at least one retailer that is now accepting used CFL light bulbs it’s the Home Depot. And we’re lucky because there are a couple ones near our place. I’m sure they’re seeing that as a good communication operation given that they may not be that many people bringing back their bulbs (I would hope that there may be more). But on the other hand I think that every retailer that sells CFL should take the same steps as the whole chain is part of the problem. For the comments : If any person has information on how the bulbs are treated after they’re being disposed at Home Depot (or other places) are welcome to comment here.